Enable your customers to choose between waiting on hold in a queue and requesting a callback. 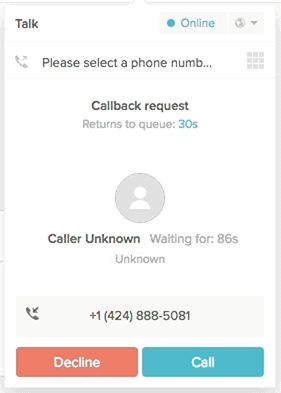 When customers select callback, their places are held in the queue and their call is automatically returned when an agent is available to talk with them. Note: You cannot configure callback as a menu option in IVR; however, if a customer is waiting to be routed to an agent in the queue, they can request a callback. You must record a new IVR greeting that can be selected in the Edit Route window. Press 2 to request a callback to a different number. The alternative number must be in E.164 format, i.e. [+ or 00][country code][subscriber number including area code]. If it's not in the correct format, the customer will be prompted to enter again. Tip: If you've set up an IVR, the callback greeting won't be played. However, once they are in a queue, customers can still press 2 to request a callback. We recommend adjusting your IVR greeting to advise callers about how to use the callback functionality. If the customer requests a callback, we'll also play a second Callback confirmation greeting confirming their choice and end the call while keeping the customer in the queue. You can select a language for the callback confirmation greetings when setting up callback (see Enabling callback). Agents click Call to call the customer back or Decline from the call console to send the call back to the queue. If your maximum queue wait time limit is reached, and a callback request is in queue, the callback will still be actioned. If it's not actioned within 60 minutes of it being requested, it will be removed from the queue and a Zendesk Support ticket is created for the agent to action later. Use the Talk Professional dashboard to analyze your account's callback from queue activity using the metrics Callbacks in queue, Total callback calls, and Average callback wait time. For more details, see Analyzing call activity with the Talk Professional dashboard and Zendesk Talk dashboard metrics reference. Callback is configured for each individual number. Toggle the Callback field to enabled. In the Language field, select a language for your callback phone number confirmation greeting. Note: If you do not select a language, Talk will automatically use your Zendesk Support default language. If your Zendesk Support default language is set to a language not included in Talk, the greeting will be played in English. In the Callback greeting field, select a greeting from the dropdown. This is the greeting that plays informing callers that they can press 2 to request a callback. In the Callback confirmation greeting field, select a greeting from the dropdown. This is the greeting that plays after callers press 1 to confirm they've selected callback. Hey guys, great new feature indeed! What happens to the callback call when no agent is online for some time, or if it exceeds hours of operations? Would the 60 mins rule still apply? Press 3 to return to the queue on hold"
Is there no option to record this message in my country language (which is Polish), instead of playing back this automatic message in English?? @Arek Gembara : You need to manually create your own greetings (hire someone for voice over with the menu's which you want) in MP3 or wave format under 10 MB size and then upload it, then you can set it as per your choice. You can make your own IVR ( Depends upon your Zendesk subscription). We have been working on bunch of Zendesk Themes, and plugins for a while. We would be happy to help you with integration. All of our premium themes come with free integration. We can do a lot more with an early feedback, and we would appreciate if you can share your feedback about anything (website ui/ux, theme ui/ux, theme code quality, etc.). Please feel free to get in touch at info@diziana.com for any question, suggestion or absolutely anything. I assume the group routing hierarchy for inbound calls will remain the same for outbound call backs? That is, if there are two available agents in will go to the agent in the primary group first? What does "actioned" mean here: "If your maximum queue wait time limit is reached, and a callback request is in queue, the callback will still be actioned." What happens if no agent is available when the maximum wait time is reached? Since no one from the community has jumped in at this point, I've asked one of our Customer Advocates to join the conversation. Someone should be along shortly to help out! My name is Patrick and I wanted to see if I could help answer this for you. Let's assume the following situation. You have 2 agents currently on calls and two customers, Jack and Jill, waiting in queue. The maximum wait time has been reached and Jack selects option for a callback. You now have 2 calls currently and 1 callback which will ring through if one of those agents becomes available before the 60 minute limit. If Jill also selects the callback option, her callback is actioned, ordered behind Jack's, and will ring to an available agent as long as the 60 minute queue limit is not reached. Best way to think about it is like the callback is holding your place in line, so even if another customer calls in, you would still have a chance to be connected first. If no agent becomes available within that time frame, then a ticket will get created and show up in the unassigned queue to be processed at a later time. "If your maximum queue wait time limit is reached, and a callback request is in queue, the callback will still be actioned. If it's not actioned within 60 minutes of it being requested, it will be removed from the queue and a Zendesk Support ticket is created for the agent to action later." The scenario talked about is assuming that the maximum queue wait time limit is reached while a call back is holding someone's place in line. Reading the first line, my guess is that "actioned" refers to the callback being "turned into" a support ticket for follow up later. What's confusing me is the next sentence, "If it's not actioned within 60 minutes..." then a ticket is created. So i'm confused what actioned means. If an agent becomes available before the 60 minute time limit, the callback will be "actioned" and it will ring through to the agent and attempt a reconnect to the customer. If an agent does not become available, it will not be "actioned" and will get dropped from the active queue, and a Support ticket will be created. In that case, I think there is a typo or i'm misunderstanding what the queue wait time is: "If your maximum queue wait time limit is reached, and a callback request is in queue, the callback will still be actioned." If the max queue wait time is reached, doesn't that necessarily mean that no agent has become available? In that case, what does "actioned" mean when there is no agent available? Thank you very much for taking the time to clarify! I can see how this statement is a little confusing. This is referring to the Agent experience and how it affects the callback. If the call rings through to the agent, and the maximum time limit for wait to answer is reached, it is put back in queue to route to the next agent. If there is a callback request in the queue, behind the current call that was just put back into the queue, it will still be actioned. As is, once the call has been picked up, the callback will be sent to the next available agent as long as the 60 minute wait time has not been reached. Great, thanks for the clarification Patrick! Not sure if there is a better place for this feedback, as the ZD forums specifically point to Support or Chat. So let me know if I should post this elsewhere. We've been using talk for a while now and only have a specific team taking callback requests or inbound calls in general. Sometimes these agents are caught by surprise or can be missed entirely. Complaints from our QA is that on these tickets, there's nothing indicating that this was a callback request. The problem with this is that if an agent has a really off greeting and doesn't mention the fact that the user has requested the call in the first place, they could be marked down for not using the proper greeting. For the notation of a callback request, there are quite a few places that could be reasonable to notate the callback. - Automatically adding a "Callback Req" tag to each ticket created. - The part of the ticket containing the call recording could contain an extra line under "Call details." - Change the Subject line of the cases created to say "Callback Request from: 555...". Thanks for your time and thank the prod/dev team for their work! One of the problems I am seeing with the callback feature is that it is refusing to use our outbound number that we have and is using the inbound number. I don't know how to correct this and support doesn't seem to either. I'm sorry to hear about this persistent issue you're having in regard to the Callback feature. So we can make sure we can come to a full resolution here, I'd like to pull this issue into a ticket. You'll be hearing from me shortly! Callback must first be enabled in your Talk settings for the feature to work. Navigate to Admin > channels > talk > numbers > choose the number in question > callback > enable the feature by clicking the toggle to blue. Once you've done this, when agents are available and online, your caller will hear the default greetings (barring the attribution of a custom greeting) prompting them that routing is about to take place, but that they can alternately choose from features you have enabled. Among these alternate options is the callback feature, where the caller hears a greeting that informs them to press 2 to request a callback. Give that a shot and let us know how that goes! Even if you create your own callback greeting there is no Action item in the Edit route Action for callback. Customer rings through to IVR and wants to speak to someone in Sales so presses 2. The customer joins the queue for sales. If there are no agents available for that group or the queue time hits 60 seconds group then it should give the customer the option of a callback. What has been suggested here is to give the option of callback at the IVR before the customer even gets to one of the queues which may or may not have agents available. Makes zero sense even if you could make it work.